But if you are, then you probably face the same challenge I do… how to prepare your photos for printing QUICKLY. I’ve got a busy calendar, and I’ve got high standards for quality. 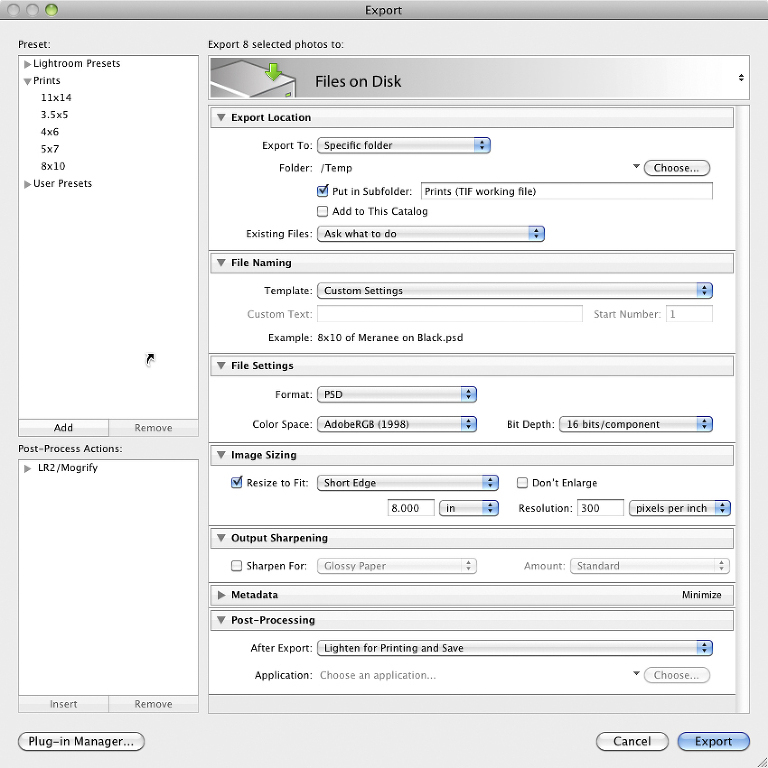 Managing conflicting goals requires a little ingenuity and a few minutes up front to prepare an automated solution. When I am going to send dozens or even hundreds of 5×7’s or 8×10’s to the printer, I don’t have to spend all day preparing images or settle for “close enough” quality, I just run an export action from Lightroom and Photoshop. So how do I do this? I use a combination of Lightroom’s export tools and Photoshop’s “droplets”. 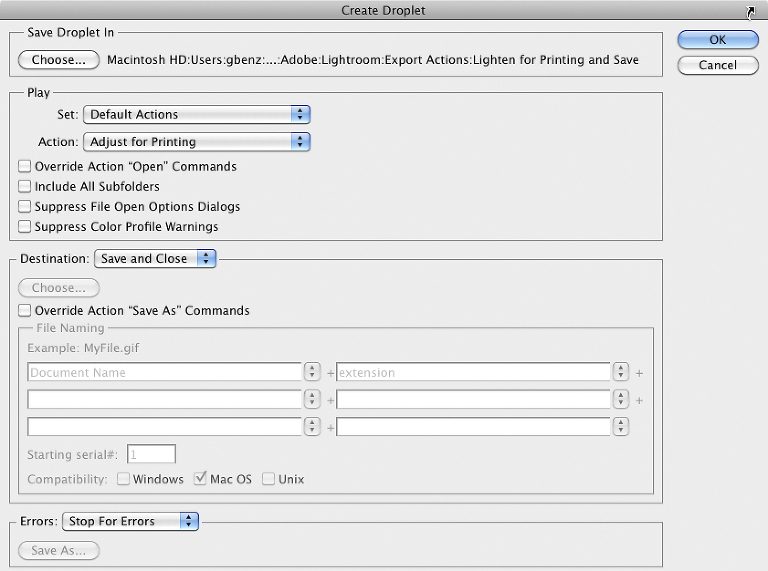 I start first by exporting the file from Lightroom as shown below. I export 16 bit PSD files into a working folder where I can make edits later (my Photoshop action saves the PSD file in case I want to edit further, but also saves a JPG image that’s ready to be uploaded). I’m currently shooting a Nikon D700, which would fill an 8×12 image perfectly, so I’ll need to crop the long edge. So, I have Lightroom export with the short edge at 8, and I’ll handle the cropping of the long edge in ROES. 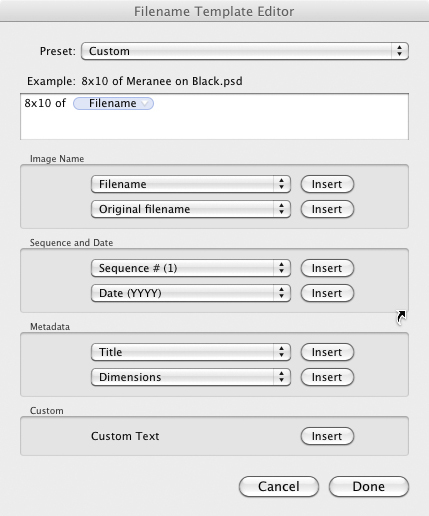 I create a custom naming template for my files that adds a description of the intended print size. This becomes critical for quality control when you have orders with multiple different sizes. When you upload the images, you’ll know immediately if you’ve made a mistake if your order list shows a 5×7 of an image titled 11×14. And when you’ve got the whole order ready to upload, it’s very easy to check the order against the customer invoice to make sure you’ve got everything right. 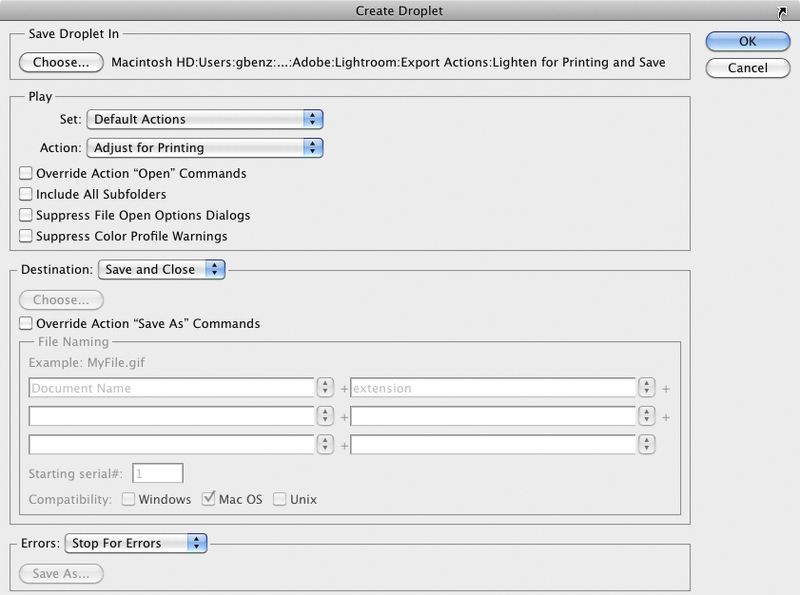 Notice that “post-processing” in Lightroom is set to “lighten for printing and save”. This is the name of a “droplet” I created in Photoshop. A is essentially a standalone macro created in Photoshop. When lightroom runs this, it performs a series of manipulations to the exported image. In this case, I have it set to apply a curve to adjust the black and white points, sharpen the image, and then save an editable PSD and a JPG which is ready to upload if no further changes are needed. I created the following “action” (macro) in Photoshop by recording the actions I took on one of the images. Note that I convert the image to a smart object so that I can change the sharpening later. You can also click the open box next to the sharpening step to mark it with a little red/white box, which indicates that Photoshop should let you choose the sharpening settings at this stage. I have created two droplets, one with and one without this dialogue box, depending on whether I expect to make changes or not. I use a curves adjustment layer to set my black and white point. My monitor can show black down to almost 0 and white almost to 255 (ie, right to the limits). But my printer, good as they are, cannot. I’ve sent a test image to determine their capabilities (a series of black boxes on a black background, and a series of white boxes on a white background). When I look at it, 10 is about the darkest black that doesn’t look identical to 0. And 250 is about the brightest white that isn’t the same paper white as 255. So, I set my curve to make 0 be 10, and 255 be 250. This reduces the contrast of the image onscreen, but it will look much better printed (if I printed directly, many shadows would simply be too dark – the blown whites are less bothersome to me, but still worth correcting). I convert my original image to a smart layer. This makes my sharpening editable later, should I choose to make some changes (I could paint the resulting mask it if I wanted to selectively sharpen). I use “smart sharpen, remove blur”. Since my images are exported at 300 dpi, I use a radius of 2 (I use a sharpening percentage of 150-200%, and adjust this number if anything). I then change the blending mode of the adjustment to luminosity (which removes any color impact of the sharpened edges). I then convert to 8 bit (to let me save as a JPG), then save one copy as an editable PSD file, and a JPG in a different directory.